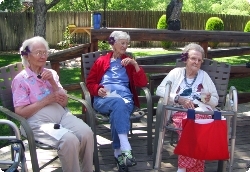 Assisted living Centennial homes function both as independent homes and as nursing homes. In fact, the facilities and services they offer lie in between independent living and being admitted into a nursing home. You can use assisted living facilities temporarily, or on a long-term basis. The normal services the assisted living Centennial homes offer include assistance in daily activities, medication management, and special safety futures. A comparison of independent home living, assisted living homes, and nursing homes should make the functions of assisted living Centennial homes quite clear. None to very Minor functional disorders. 400 sq. ft. to 3,000 sq. ft.
250 sq. ft. to 600 sq. ft.
100 sq. ft. to 300 sq. ft. Assisted living homes and facilities have several advantages. Socialization at such homes is quite high compared to living at home. Nearly all assisted living facilities have a full-time supervisor or director to organize regular activities for the residents. Further, they offer moderate levels of physical and mental health rehab programs, or services to help the seniors rebuild their mental and physical abilities. They help the elders in regaining their health to a sufficient level, so that they can return back to independent living. For those persons with advanced Alzheimer’s and other dementia related disorders, many assisted living Centennial homes offer end of life Hospice services at a separate cost. This relieves the elders and their family members from the worry of adequate care when the life of the residents comes to an end. Several good quality assisted living homes and facilities are operating in Centennial. Some of them are St. Bernadette Assisted Living, St. Claire Assisted Living Facility, Colorado Assisted Living Homes, Serenity House Assisted Living, Millbrook Homes, and Lighthouse Assisted Living Inc. You can visit these homes and evaluate the quality of their services and facilities before deciding on the right assisted living Centennial home for your loved one.